Monday, Sept. 3, 1888 About as warm, but mercury not quite 80 degrees & quite pleasant still. 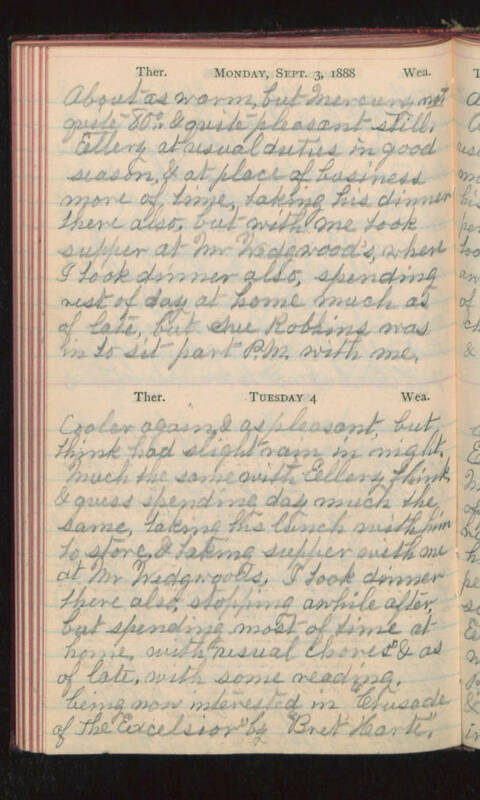 Ellery at usual duties in good season, & at place of business more of time, taking his dinner there also, but with me took supper at Mr Wedgwood's where I took dinner also, spending rest of day at home much as of late, but Sue Robbins was in to sit part P.M. with me. Tuesday 4 Cooler again & as pleasant, but think had slight rain in night. Much the same with Ellery think & guess spending day much the same, taking his lunch with him to store, & taking supper with me at Mr Wedgwoods, I took dinner there also, stopping awhile after but spending most of time at home, with "usual chores" & as of late, with some reading, being now interested in "Crusade of the Excelsior" by "Bret Harte"